Bando 8PK760 Automotive Micro-V. | Replaces GATES K080300 SERPENTINE BELT | Metric Automotive Serpentine Belt 8PK760. Home > Automotive Belts > Automotive Serpentine Belts. PK, K Section Poly V > Bando 8PK760, 8 Rib Automotive Micro-V (PK/K Section). Bando 8PK760, 8 Rib Automotive Micro-V (PK/K Section). Bando 8PK760 Automotive Micro-V. 760mm (29.9") Effective Length, 8 Ribs in PK/K Section. 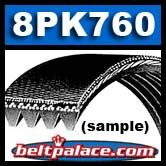 Metric Automotive Serpentine Belt 8PK760.